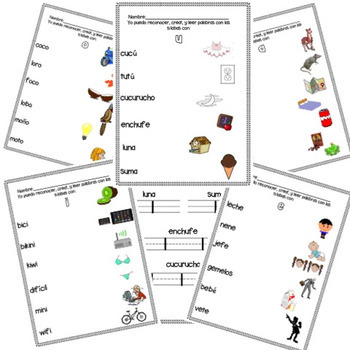 Save time and $$$, buy my Bundle of Spanish Reading Centers! Time to practice Spanish syllables! 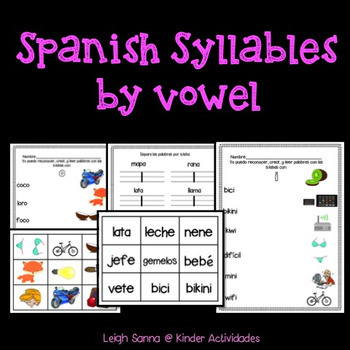 With this center, or whole group activity, students will work with each vowel sound separately, learning how to combine the vowels with consonants to form syllables. Students will match the simple word to its picture by drawing a line. The back of each worksheet asks students to separate the word by syllables. We first practice this skill by orally separating syllables with claps. "casa: ca-sa, gemelos: ge-me-los". On the worksheet, students must write the syllables separated by the lines provided. The very last task is to combine the syllables to form their own words-whether they be real or nonsense! I have also included pages of ready to print, cut, and laminate clip art pictures that match those from the worksheets. 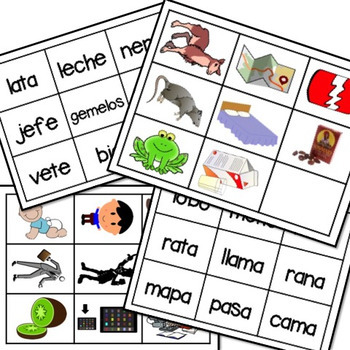 These can be used as flash cards, or as part of a matching game in the center. There are also cards with the name of each word. Students can match the picture cards to the word cards. This makes for a great, independent center or whole group practice worksheet! This is meant for beginning Spanish readers.